Corporate social responsibility is typically associated with large companies, not small businesses. But as companies of all sizes are quickly learning, social responsibility is a contemporary business imperative. In particular, education-driven initiatives are popular with small and mid-sized business owners. Two out of three mid-sized business owners say they are seeking to improve community engagement through education initiatives aimed at younger community members, according to Business News Daily. Unfortunately, despite the best of intentions, CSR often becomes an after-thought for small business owners who are too busy growing their business to focus on secondary initiatives like CSR. It doesn't have to be. 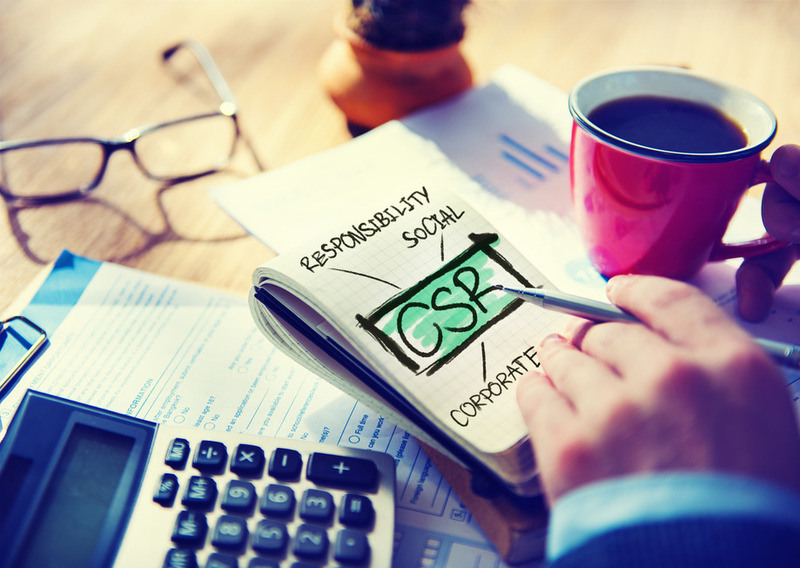 CSR goes hand-in-hand with a smart brand strategy. Consumers vote with their wallets, supporting companies that demonstrate concern for employee welfare, community development, environmental sustainability, and human rights. "We live in a customer-centric and highly connected world where consumers not only want to feel good about their purchase but also want to make use of social media to share the story behind the purchase. Consumer sentiment can make or break a business. Having a positive social purpose and a core message that resonates with your audience can be the key business differentiator." says Creative Brand Strategist Andrew Miller, who works closely with small businesses to help them structure effective CSR programs. When it comes to successfully executing CSR strategy, even big corporations make mistakes, especially if they fail to consider the long-term impact of their efforts to give back. Case in point: Toms Shoes. From a marketing standpoint, Toms Shoes "Buy One, Give One" model is a winner. It's easy for consumers to connect with a concrete concept like putting shoes on a poor child's feet, rather than a more abstract concept like donating 10 percent of profits to research. But while the slogan may be good for business, critics say that the "Buy One, Give One" model creates dependency, zaps local initiatives, and ultimately hurts local businesses. As Michael Matheson Miller, the director of PovertyCure, a group promoting entrepreneurial solutions to poverty, tells Knowledge@Wharton, "Poor people aren't poor because they lack stuff; they're poor because they lack the infrastructure to create wealth." Ultimately, donating a pair of shoes may do more damage to the local economy than good. In other cases, donating a pair of eyeglasses may be just fine if these donations don't undermine an existing local industry. Warby Parker, for example, uses money from every pair of glasses the brand sells to train locals at giving basic eye exams and then sell glasses at a significantly reduced rate. This turns an otherwise needy beneficiary into a responsible consumer, which Warby Park co-CEO Neil Blumenthal says empowers rather demeans the recipient. The company partners with Vision Spring, a like-minded nonprofit, to manage the training and eyeglass sales. So how can you ensure your program is more than just well-intentioned but actually effective? For businesses that wish to alleviate poverty, Miller recommends focusing efforts on ways to create prosperity for families, such as removing barriers to education. In other cases, a "buy one, give one" approach may work, as long as the recipient's needs and environment are carefully considered. Other companies have found success in providing microloans or making scholarship donations that restore community health, rather than just alleviating symptoms or causes. Katherine Klein, the vice dean of Wharton's Social Impact Initiative recommends businesses embrace the spirit of innovation and experimentation with their CSR models as "it's not clear yet which approaches have the greatest sustainability and impact." Pick the right partner. Small businesses are simply not equipped to manage every aspect of a CSR program on their own, nor should you try. Attempting to do so will simply deplete program resources, along with the energy and enthusiasm your employees have for the program. Let the experts help! Choose a partner nonprofit that naturally aligns with your company's core mission and services. For example, if you run a small optometry practice, you may not be able to fund a "Buy a Pair, Give a Pair" program on the scale of Warby Parker, but you can still support vision initiatives, like the Vision Experience Foundation. Structure for sustainability. You may mean well with your CSR, but if it's not aligned with your business model, it will become a one-time project rather than a sustainable program. Look for ways to blend financial support with volunteer service or in-kind contributions. Consider how your customers or clients will be involved. Don't limit involvement to simply donating a percentage of your annual profits. Consider sponsoring a "day of giving" in the community, where customers, clients, and employees can work together to complete a volunteer project aligned with your CSR. Support community education. Looking to make an immediate impact on your local community? College or advanced degree scholarships are one of the most popular CSR choices that make a direct impact on the recipients' lives. David Resnick & Associates, PC recently launched a scholarship essay contest for students pursuing a two-year or four-year college degree who are interested in attending law school. "The cost of attending college leaves too many students crippled with loan debt or unable to pursue advanced degrees," says David Resnick, the firm's founder. "We chose to offer a scholarship competition in order to empower deserving students to achieve their legal education dreams." Don't shy away from personal causes. When a cause is near and dear to your heart, your passion for this cause will naturally shine through, inspiring your fellow employees as well as customers and clients. For small businesses, choosing personal causes that are closely aligned with the local community will also inspire community-wide involvement that goes beyond just your current employees and customers. For example, Colorado law firm The Sawaya Law Firm gives out "The Sawaya Awards", which recognize Coloradans who are committed to helping themselves and members of their community reach their full potential. The firm also helps community members in need through the Sawaya Foundation, which recently launched a matching fundraising drive to support a Denver police officer who was severely wounded during a routine traffic stop. Monitor customer impact. In addition to monitoring the success of your CSR program, you'll also want to understand how customers and clients perceive them. For example, when Tom's started getting pushback from customers about their "buy one, give one" donations, the company reworked their program to make it more sustainable and less disruptive to local communities. (They now invest in companies that match their CSR mission, too.) While it's unlikely that customers will approach you directly about your CSR, if they feel strongly about it one way or another, they probably will discuss it on social media. I like Brand24 and Follow for monitoring social media chatter. You can use these platforms to set alerts for online mentions and specific keywords related to your CSR. There's no need to rush head first into a huge CSR program. Start slowly and grow with time. Whether your company is a small business or a major corporation, choose a CSR program that realistically reflects your business's ability to give back. For small businesses, this could be a scholarship program like the one recently launched by David Resnick's law firm or the "Sawya Awards" for outstanding community members. Other great options include a company-wide volunteer day such as Habitat for Humanity (invite your customers/clients to join in!) or a recurring donation to a nonprofit aligned with your business's services. Whichever approach you choose, be sure that your program is fully integrated with your business's core mission for long-term, sustainable growth.